RA is a little more expensive than Type A, but it is obtained as a result. This review is about item#5801232. As expected it is Band Red. I have five years to have peace of mind. This review is about item#05801336. 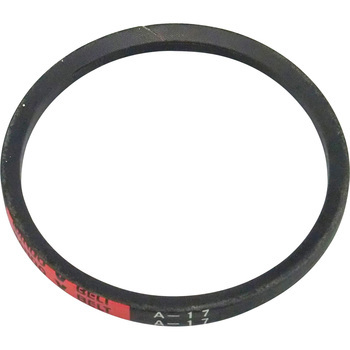 Although it is used less frequently, red than the normal belt has durability and it can be used for a long time. Other agricultural machines are also over spec, but we use cog belts and red. This review is about item#5801625. Very good product, inexpensive and excellent item. Improvement points are not attainable. This review is about item#05801406. Since it is a maker item, there is no problem. Delivery is also early and it will be saved. This review is about item#5801354. I did not sell it to my neighborhood so I bought it and was right. We use it conveniently. This review is about item#5801372. This review is about item#5801406. This review is about item#5801363. It is a well-established manufacturer product, it can be used safely and securely. It is attractive in terms of price. This review is about item#5801284. Since it was a consumable item, I replaced it because it was in a state of breaking. It was a thankful price that I could use without any problems. It is sturdy, so it is very good. I feel I've powered up from the standard. I am looking forward to how much it can be used. This review is about item#5801424. This review is about item#5801311. This review is about item#5801476. This item is purchased several times in repeat. Due to its good durability, maintenance time is drastically reduced. This review is about item#5801677. This review is about item#5801485. Purchased because the belts for driving the exhaust fan, which are running for 24 hours, have run out. It cheaply arrived soon, it was saved for repair as soon as possible. Since energy saving belts are not sold, purchase the highest grade here. Energy saving Belt is still better. This review is about item#5801661. If it is an ordinary thing, it will be exchanged without a year, but after RED, I forget about when I exchanged. This review is about item#5801293.